This post contains affiliate links. 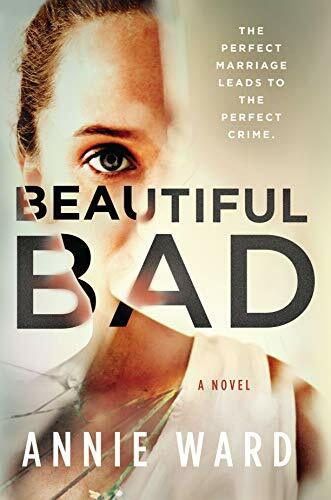 I will receive a commission at no extra cost to you if you make a purchase using one of my buy links. 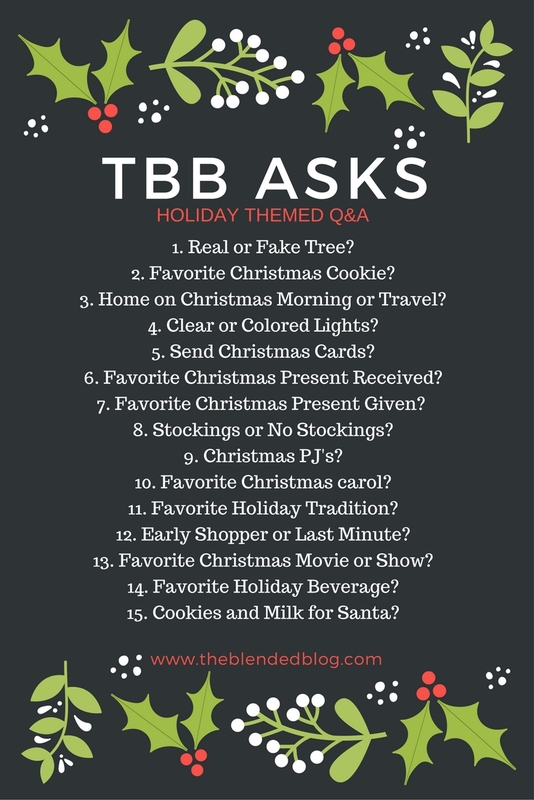 You guys may not know this about me, but I love Q & As and tags. 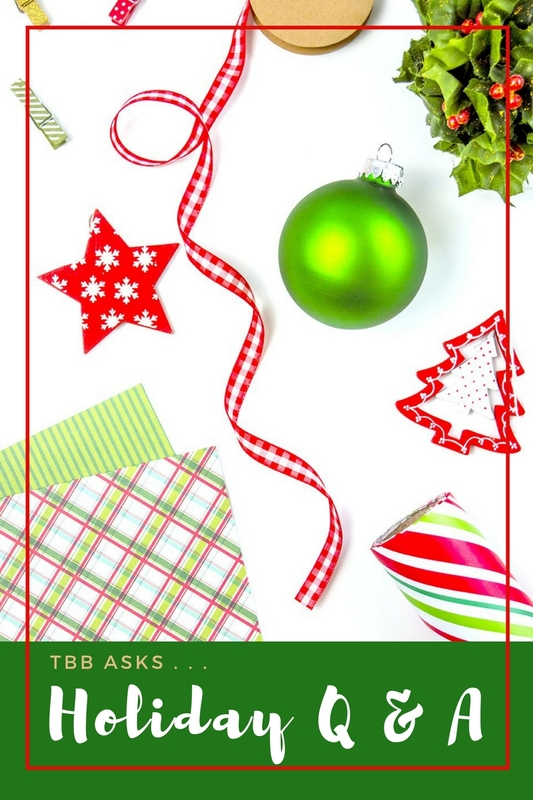 I saw this TBB Asks Holiday Q & A going and thought I'd give it a go. After all I do love the holidays. Plus, I think these kind of posts help us to get to know each other on a more personal level. And they're just plain fun to do. Real or fake tree | Fake. I wish we could do a real tree. Unfortunately the smell of real Christmas trees doesn't sit well with my husband. As a kid, my family always had a real tree. I don't think my mom got an artificial tree until I went off to college. I'm hoping that one day my children will be able to experience a Christmas with a real tree. Favorite Christmas cookie | I don' have a favorite type of Christmas cookie, but my favorite brand is Cheryl's. My husband ordered them for me from QVC one year and I've been hooked ever since. They are so good and probably the most delicious cookies I've ever had! If you like soft cookies, then definitely order some. Home on Christmas morning or travel | We stay home on Christmas morning. The kids like to have to time to play with their gifts and then we also like to watch the parades, some Christmas movies and then have a late Christmas lunch. This year will continue our tradition of starting Christmas off at home, but we'll be traveling to my sister's that evening to spend time with my family and exchange gifts over dinner. Clear or colored lights | Both. We do a string of multicolored lights around the body of the tree. Then, we have a star that has clear lights to go on the top. Next year we're going to be switching it up and putting our old tree in the dining area/kitchen. I'm going to snag a prelit tree during the After Christmas sales when they're dirt cheap. And I'm on the look out for an African American angel to go on our living room Christmas tree for next Christmas as well as new star for our current tree. Send Christmas cards | Yes, I do send out Christmas cards, but I dropped the ball this year. Our move just threw everything off. However, I'm going to be stocking up on cards from Hallmark at their After Christmas sale. This way I'll be prepared for next year. I'm hoping I can snag some that you can insert your family Christmas photo into. Favorite Christmas present received | This might sound cheesy but I'm going to say my children. I had my daughter a few weeks before Christmas and I was pregnant with my son through Christmas. Thankfully, he gave me a break on morning sickness that day. Aside from that my favorite Christmas present is just getting the opportunity to spend time with my family. I'm not a materialistic person unless we're talking about books. LOL. Stockings or no stockings | We do have stockings, but we didn't put them up this year partly because I couldn't remember where I had packed them. Also, we don't have a fireplace anymore and I wasn't sure where we'd hang them. Then, there's the little problem of me not liking the way our current stockings look. The Mr picked them out and they're just those cheap white and red ones that are like $1.98. I want to trade them out for some faux fur or crushed velvet ones with our names or initial embroidered on them. Favorite Christmas carol | The Christmas Song sung by Aaron Neville and Oh Holy Night. Favorite holiday tradition | Putting our tree on November 1st every year is by far my favorite holiday tradition. I know we're supposed to have our Christmas spirit inside of us year round, but there's just something about seeing the symbol of hope, joy and happiness that really brings it to life. Waking up and seeing the tree lit every morning gives me a happiness that I can't explain and it reminds to be grateful and that there is still light to be found in this world. It's also a reminder to work harder to let my little light shine too. Early shopper or last minute | I would consider myself more of an early shopper. I try to start my Christmas shopping the day after Christmas. Throughout the year I'll pick up more gifts here and there. Last minute shopping just isn't my thing because most of the stuff is picked over by the time December is here. Favorite Christmas movie or show | Elf and National Lampoon's Christmas Vacation are hands down my two favorite Christmas movies! They're both incredibly funny. Favorite holiday beverage | Hot chocolate of course! When I was younger my mom used to make this really delicious holiday punch. She hasn't made in years. I'm thinking about asking to revive the tradition this year. Cookies and milk for Santa | My kids already know that Mommy and Daddy are Santa. They do love making us cookies though. And we also have a tradition of making a birthday cake for Jesus. They love doing that and I hope it's tradition that we can keep up and that they'll pass down to their kids. 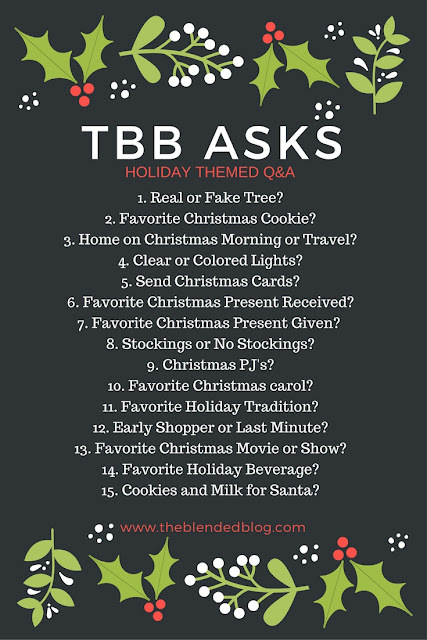 This Holiday Q & A was really fun. Feel answer any of these questions in the comments. I love chatting with you guys! No worries on the cards, moves take a lot out of you. YUM to all the cookies. Yes, they do! I'll be on top of my card game for sure next year though. Aww I love that your children are your favorite Christmas presents! I just watched Christmas Vacation for the first time this weekend since my boyfriend couldn't 'believe I had never seen it before lol. It was too funny! I hope you and your family have the best holiday season! !